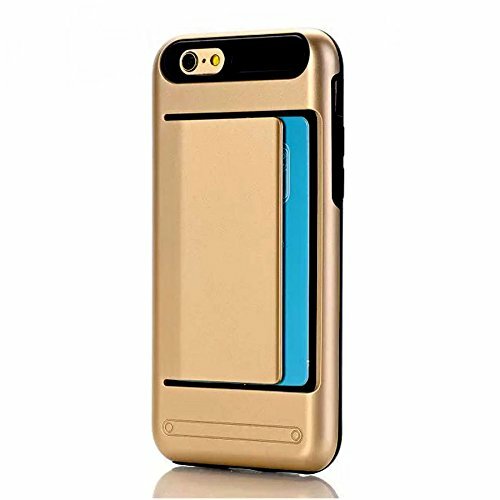 Color:gold Description: Slidable Card Slot Wallet Case for iPhone 7 (4.7" Display), Not for iPhone 7 Plus (5.5" Display)!!! Highlights: - 2 in 1 case, the idear of wallet and phone case to offer customers convenience in daily life; - Rugged TPU cover absorb shock and impact from low drops/bumps (within 0.5meter); - Scratch resistant PC cover, luxury and stylish, easy to clean, comfortable to hold; - Useful and eye-catching case to match brand new iPhone 7 and offers basic protecton; Package includes: 1 x Card Holder Wallet Case for iPhone 7 only, phone not included. Warm Tip: 1.The card slot can be hard to open when first use, it becomes better after few time uses. 2.Please buy a shatterproof screen protector for extra protection against drops and impact. 3.If the case separated into 2 pieces, gently put them together then it can be sued again. Click the Add to Cart button now and get yourproduct TODAY !